Polyisobutylene (PIB) Market size was valued at over USD 1.25 billion in 2015 and will witness gains close to 5% CAGR by 2024. The global polyisobutylene market size was primarily driven by strong product demand in tires and tubes manufacturing. Rubbers including the PIB, styrene–butadiene rubber (SBR) and nitrile rubber (NBR) are widely preferred in manufacturing tires (mainly tubeless tires) and tubes owing to its impermeable nature. Increasing tubeless tire demand due focused on durability along with low maintenance cost will significantly boost business growth. Strong automotive demand in North America and Europe paired with inclining automotive demand in BRIC nations with consumer demographics will complement the industry. The overall automobile production, including both commercial and personal vehicles, was close to 75 million units in 2010 and reached approximately 90 million units in 2015. Furthermore, the overall tires & tubes business was close to USD 3 billion in 2015 and is likely to surpass USD 4.5 billion over the projected timeframe. This inclination will consequently boost the overall polyisobutylene market. The global medical packaging industry was valued roughly around USD 20 billion in 2015 and will exceed USD 30 billion over the estimated period. The product is widely preferred in the medical packaging industry owing to high chemical resistance and low permeability to air, moisture and gases. It is also used medical packaging applications such as saline bottles, serum vials, injectables, and seals. Additionally, high cleanliness along with the product advantages over natural and other synthetic rubbers in pharmaceutical packaging such chemical and biological inertness, excellent self-sealing and good fragmentation performance will boost the polyisobutylene market share by 2024. Use in ship engines as a lubricant contaminates water and effects the aquatic life by causing deaths and genetic alteration. For instance, in 2013, more than 2,500 seabirds died due to the product stickiness. Increasing awareness towards protecting the environment along with stringent government legislations may hamper the PIB market. 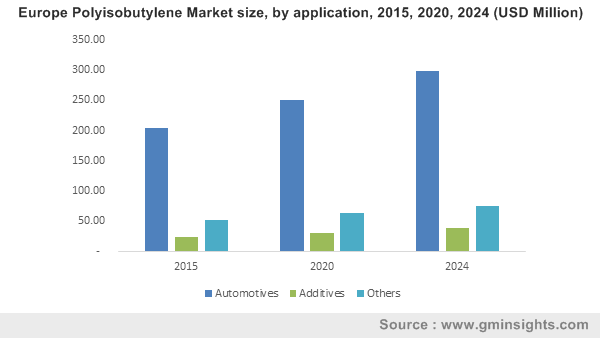 Increasing R&D investments, technological advancements and rising product usage in tubeless tire manufacturing will substantially create growth opportunities for the polyisobutylene market share contributors. High molecular weight led the overall industry in 2015. The product is broadly preferred in the automotive and sealants industry owing to its value-added heat resistance and oxidation characteristics. Furthermore, increasing product usage in electric wire coatings manufacturing due to its light weight, dielectric properties and enhanced flexibility will stimulate business growth. Medium molecular weight PIB market share is forecast to experience growth close to 5% due to its widespread applications across adhesives industry. The global polyisobutylene market size for automotive accounted for more than half of the global volume in 2015. Tire and tubes are the basis components used in the automotive industry. The product is used for inner liner in the tire, which holds the air. It offers superior inflation pressure holding, ozone resistance, high damping, barrier properties and heat aging, which makes it suitable for automotive vibration control for all the tire types. Positive growth indicator in the automotive industry, particularly due to improving consumer lifestyle dynamics will positively influence the business growth by 2024. Adhesive polyisobutylene market applications will observe highest gains more than 4.5% CAGR over the projected period. The product derivatives are used widely as additives in lubricating oils & fuels to reduce the oil mist generation. It is also used to clean water-borne oil spills and lubricants thickening agent. Increasing lubricant demand for automotive maintenance will positively influence the overall market size for adhesives in the coming years. North America, mainly led by the U.S. polyisobutylene market size will witness growth close to 4% over the forecast timeframe. Increasing durable tires demand from consumer to hold strong grip in snow will positively influence the regional growth. Massive automobile customer base in the U.S will push the business growth for additives. In addition, upcoming U.S. construction industry will boost the product demand for adhesives and sealant applications. Asia Pacific led the global polyisobutylene market size in 2015. Prevalence of strong tire and tube manufacturing industries in China, India, Indonesia and Malaysia was the major factor contributing the regional business growth. Increasing automotive sales in India and China, mainly due to increasing consumer per capita disposable income along with reduced interest rates on car loans will complement PIB market size. The global polyisobutylene market share was highly consolidated in 2015 with top three manufactures accounting for more than half of the global share. Key industry players have their presence across multiple stages of the industry ecosystem, which helps them to acquire a massive chunk of the business share. Some of the product manufacturer includes BASF SE, ExxonMobil Corporation, Lanxess AG, TPC Group, The Lubrizol Corporation, Chevron Oronite Company LLC, Infineum International Ltd. and Berkshire Hathaway Inc.
Polyisobutylene (PIB) is a commercial polymer used in widespread applications in numerous industries due to its superior flexibility thermal stability and impermeability to gases. It offers high resistance to acids, alkalis and salts. The products major application includes manufacturing of inner tubes of tires and adhesives & sealants. Its derivatives are used as additives (thickening agent) in lubricating oils and motor fuels to minimize oil mist generation. Robust growth in end-user industries including construction and automotive will substantially boost the product demand by 2024 and thus boost the polyisobutylene market size. Asia Pacific accounted for more than half of the global volume and revenue, particularly due to increasing end-user industries in China and India.